Considering the title of my blog, I feel like it’s time for a little confession. I haven’t “confessed” in awhile and now seemed like a good time. So, here goes! As many of you know, I lost my weight through Weight Watchers (WW) – a total of about 60 pounds (or at least I’ve hit 60 pounds lost several times!). I joined WW the week before Thanksgiving back in 2008. 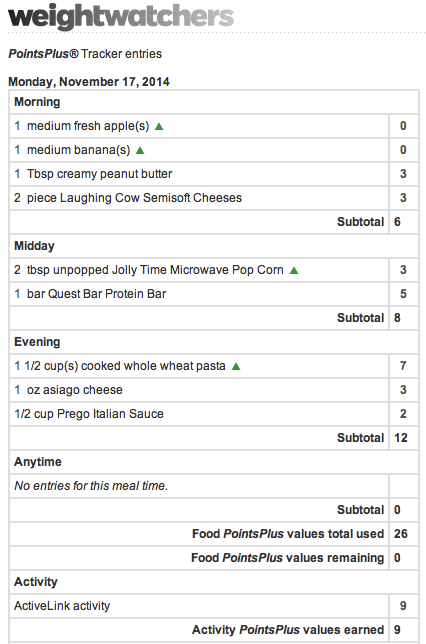 Since that time, I have kept up with tracking my food – for the most part. I made a deal with myself when I started that when I take a vacation from life, I also take a vacation from tracking. Well, back in October, my hubby and I took a vacation to Denver to run a half-marathon. We left October 14 and returned home October 22. I didn’t track that whole time. I usually don’t go all out when I am on vacation when it comes to food. I definitely eat A LOT different than I used to. I still try and maintain a healthy eating style, but there are maybe a few more indulgences than normal. For tracking, my week starts on Friday and ends on Thursday. Because we left on our vacation on Tuesday, I didn’t think it would pay to start tracking my week the Friday before, so the last day I had tracked was October 9. When we got back from vacation, which was a Wednesday, I didn’t start tracking because my new week would have started on Friday, the 23rd, so I thought I would just wait until then. When I had weighed in on that Friday, October 23 (after being on vacation) I had actually lost weight – a total of 1.8 pounds. 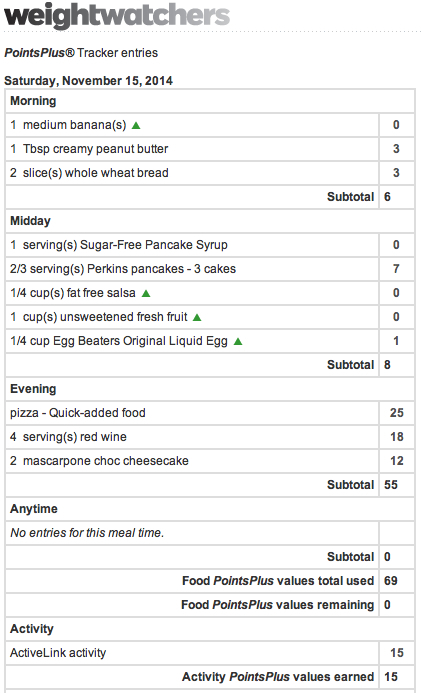 Keep in mind that the week before that, when I weighed in on the 17th, I had gained a pound. But, also keep in mind that for that weigh-in, I weighed myself on a scale at a restaurant that I had to put a quarter into and it not only told me my weight, but it also told me my fortune! And, I weighed in at night with all my clothes on, when I typically weigh-in in the morning and in my birthday suit! The fortune scale was the only scale I had access to the whole vacation. None of the hotels we stayed at had a scale and I know this because I asked. At every single hotel. Yes, I could have found a WW to go weigh in at, but it didn’t fit into our schedule! Anyhow. Back to tracking. And this is where the confession comes in. I didn’t get back to tracking until Friday, November 14! I didn’t track for a whole month! WTH! And honestly, it was only because one of my members was talking about how she was struggling with tracking and I challenged her to exchange trackers each day. We have since been sharing our trackers with one another. 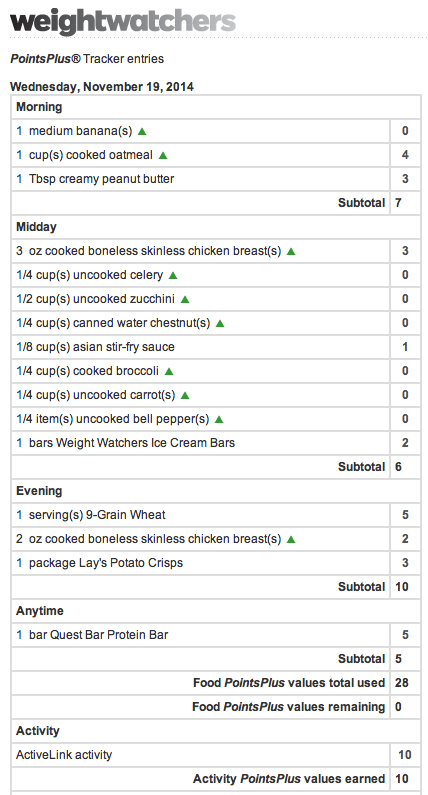 Thanks to her, I am back on track and back to tracking my food every single day! So, a big kudos to her and she knows who she is! THANK YOU! With that in mind, I thought I would share my tracker with all of you. 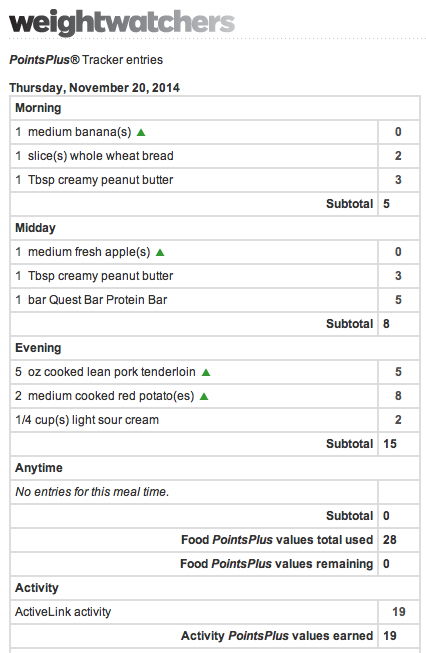 I have so many WW members ask me what I eat every day, so I thought I would put it out there. 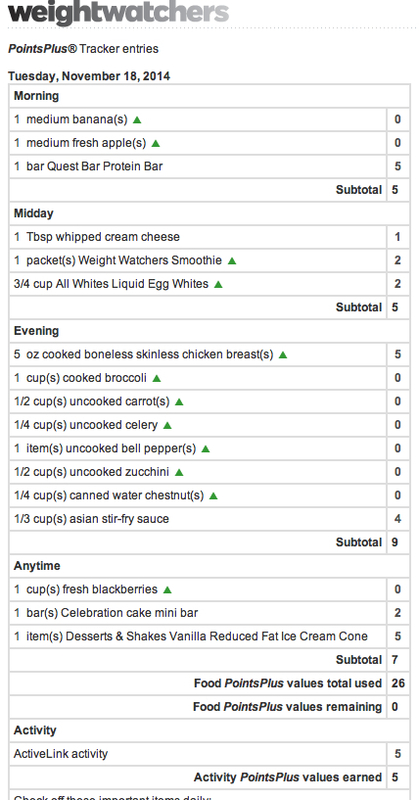 Here is my food tracker beginning on Friday, November 14 and ending on Thursday, November 20. It is one week’s worth. I will tell you that YES, I do estimate some times. My tracker is far from perfect, but it is what it is. I do the best I can and that is all I ever expect from anyone else. So, there you go. My food for a whole week. If you have any questions, please feel free to ask. As many of you know, I am pretty open and honest and I have been about my journey. I am real. I am genuine. I tell it like it is. 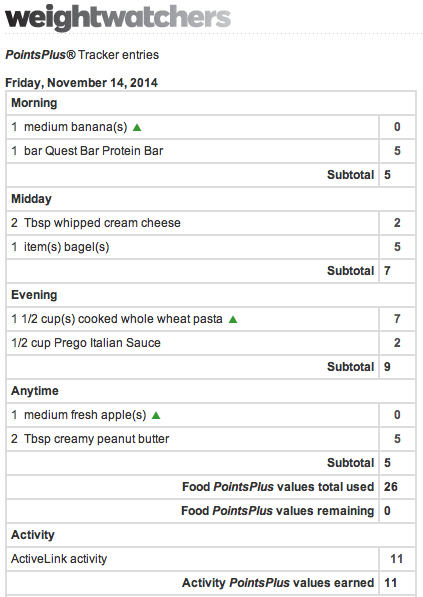 And with that in mind, I thought I would show you my weight tracker, as well. 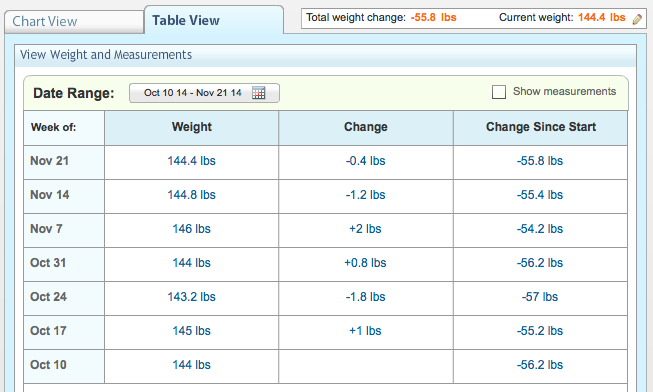 The first chart is my weight gains and losses since the start of my vacation through now. 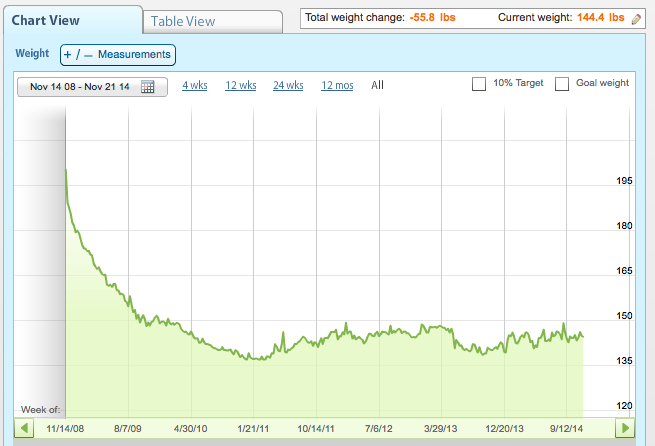 The second one is my weight graph from the time I started WW until now. If you notice, I’ve had quite a few ups and downs. It has been quite the roller coaster ride! Again, if you have any questions, please ask. I don’t mind sharing my journey – ALL of my journey! And, remember, you can always find me on Instagram here, Facebook here and here! Thanks for taking this journey with me! I appreciate each and every one of you. Thanks so much, keen peach! When I started this journey, I decided that I wanted it to be real. I wanted to be honest. I wanted to share everything, which I realize, sometimes is too much…for some people! But it is what it is and I am what I am. A true, genuine, honest, real person! Thanks for reading! Please shares how you stay so motivated to track. I get sooooo tired of tracking but I do my best when I track. Does Al track? My hubs doesn’t watch what he eats and it makes it so hard for me. You know, motivation is a hard thing. Sometimes, I do lose my motivation and get in that I-don’t-care mode. BUT, then I remember where I started and I know I DO NOT want to go back there. I love where I am at and who I am now. Al doesn’t track, but he is SUPER supportive. I am blessed that way. But, he does do a lot of snacking, too. I have realized that this journey is about me. I have learned, some how, some way, to make it about me. Yes, that sounds selfish. But, it is what I had to do. I don’t let what others do or don’t do affect me anymore. I am not sure how I got to this point, but I just do what is best for me. And, truthfully, if Al is eating something and I want some of it, I will eat it. AND, not feel guilty about it. Then, I either cut back on food the rest of the day or week or whatever and then kick up the activity. Each person has to find what works for them. For me, I really got it in my head that this is a lifestyle, it is the way I live, it is who I am. It is not a diet that starts and stops. This is for the rest of my life. I hope that all makes sense. It is hard and sometimes, I want to throw in the towel, but I can’t. This is MY life now. And it is SO worth it. Thanks for sharing! I love seeing other people’s trackers 🙂 I do have a question though: is there a reason that you don’t use all of your points? I noticed that you earned 69 activity points, but you only ate about 26 points per day (with the exception of your one high point day). I know everybody is different, but I don’t have ANY energy on just 26 points. I am just curious if you have a reason for not using your AP’s? Well, the thing is, sometimes, I don’t track perfectly, I tend to do a lot of guesstimating, so, I figure some of activity points do get used, they just don’t show as getting used. I like to use all my weekly allowance, but I like to just see my activity build up. Also, I am not 100 percent sure my activity points are that accurate. Yes, I do use the ActiveLink, which I love, but sometimes, I question its accuracy. 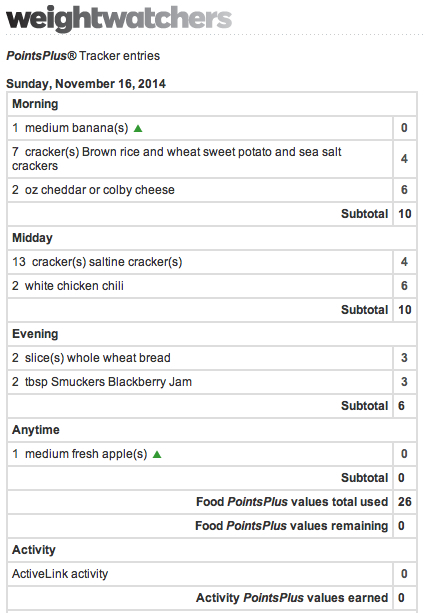 Also, for me, if I were to eat all my daily points, my weekly allowance AND my activity points, I would gain weight. And right now, I would like to lose another five pounds, but at the same time, just keep maintaining! Hope that all makes sense! Do you think you’d be able to track without WW? Is that the foundation of your weight loss? Hi Ally! Weight Watchers is definitely the foundation of my weight loss and I am pretty sure I am now a WW member for life. Will I always track? Probably. I actually do enjoy it. But we’ll see what happens! Thanks for reading! Next Next post: A healthier Thanksgiving!